Rembrandt’s “Jan Rijcksen and His Wife, Griet Jans,” known as “The Shipbuilder and His Wife,” is on view as part of the “Class Distinctions: Dutch Painting in the Age of Rembrandt and Vermeer” show at the Museum of Fine Arts. An exhibition that can casually boast the inclusion of two paintings by Vermeer, four by Rembrandt, and three by Frans Hals requires no recommendation from an art critic. And yet, funnily enough, those prominent names — and the superb paintings to which they’re attached — are almost incidental to what makes “Class Distinctions” at the Museum of Fine Arts the great show it is. What the exhibition offers is an unprecedented chance to see, in cross-section, one of the most dynamic societies the world has known, in images invented by a cast of painters as brilliant as any in history. The Netherlands, at the beginning of the 17th century, was a conglomeration of neighboring provinces engaged in fighting off the dead hand of Spanish rule. It was a freshly shucked republic. Its armies were winning. Its economy was booming. Its population was exploding. When you feel new, you want to form an idea of what you look like. So much felt new about Dutch society in the 17th century that it’s easy to understand the eagerness of Dutch citizens to possess images of themselves. “Class Distinctions” honors this urge. 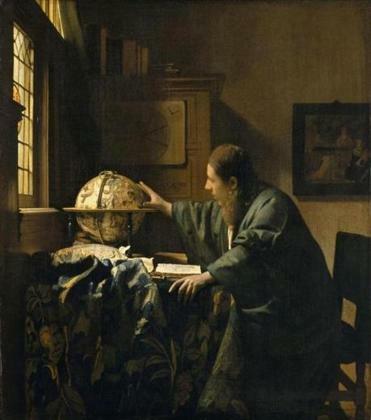 It presents 75 paintings; all are of the highest caliber aesthetically, the works by Hals, Rembrandt, and Vermeer matched by paintings just as fine by, among others, Jan Steen, Gerrit Dou, Pieter de Hooch, Aelbert Cuyp, and Gerard ter Borch, borrowed from museums and private collectors across Europe and the US. But they have been chosen also for the particulars they reveal about Dutch society at every level. “Other art is worth your while! 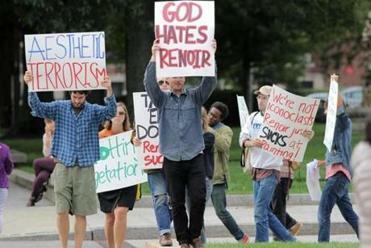 Renoir paints a steaming pile!” protesters playfully chanted outside the museum. The exhibition is divided into sections that correspond to three main classes: upper, middle, and lower. Advancing through the show we go from the court and political elite to the poor and indigent, via the (dwindling) Dutch nobility, the politically powerful burghers and merchants, professionals and tradesmen, working women, and manual laborers. The show’s final section focuses on paintings of the various classes mingling — in a city square, at a rambunctious fair, on the ice, in a ferry, at the threshold of a fancy home. The whole thing, cumulatively and individually, is a joy — a visual banquet that happens to afford priceless insights into the workings and self-image of an entire society. Everyone will have a favorite gallery. For many, I suspect, it will be the section devoted to regents and wealthy merchants, if only because it contains the two Vermeers flanking “Lady at Her Toilette,” a smack-down, full-throttle masterpiece by Gerard ter Borch from the Detroit Institute of Arts. Expect throngs to set up camp. The section also includes a full-length portrait, oozing nonchalance, by Rembrandt beside a flamboyant Hals on the same grand scale, as well as portraits of married couples by Bartholomeus van der Helst, Jan de Bray, and ter Borch — who, here and in subsequent galleries, quietly establishes himself as the star of the show, a painter of outlandish ability and ineffable tenderness. Impossible to overlook in this same section are the two huge group portraits by Hals and Jan van Ravesteyn. The Hals shows the board of a hospital for the poor in Haarlem, the van Ravesteyn a company of militiamen. Both speak volumes about Dutch civics and the wealthier class’s self-conception. After such a thunderous volley, it’s a wonder that the rest of the show isn’t anticlimactic. But if anything, its quotient of surprises and thrills increases. The section devoted to professions and trades presents bakers, barber-surgeons, silversmiths, tailors, and soldiers, all in paintings filled with telling detail. Seventeenth-century visitors to the Netherlands often remarked that Dutch women were involved in business affairs to an unusual degree. Rembrandt’s double portrait of Griet Jans delivering a letter to her husband, the shipbuilder Jan Rijcksen, makes this easy to believe. With her hand on the door, her vigorous intrusion into painting’s tight space, and her clear-eyed, sober expression, she is much more than her husband’s helpmeet. 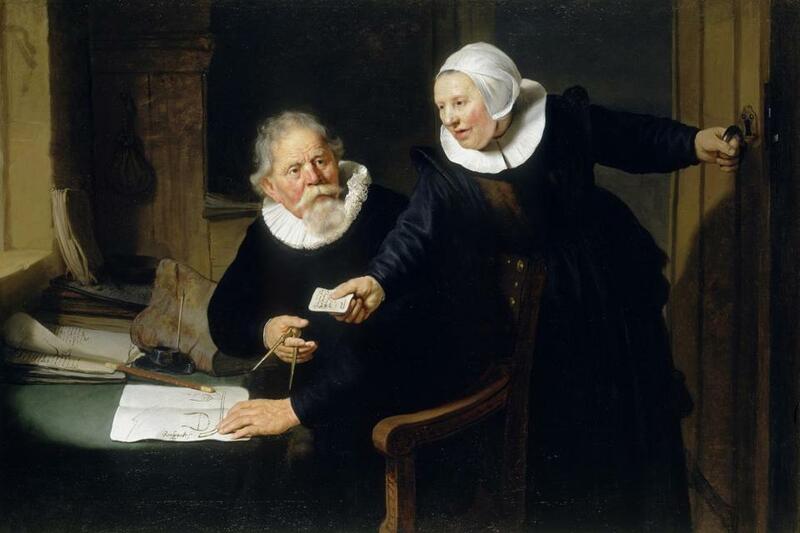 The Rembrandt is fun to compare with Job Berckheyde’s painting of a notary, also handing over a letter. Wearing a Japanese silk robe and slippers, he swivels in his chair, which is elevated on a wooden platform to avoid cold drafts. Whatever the letter’s contents, it’s clearly not good for his gray-bearded client, who has such an air of shame about him that you wince and want to look away. Like a naked man instinctively shielding his private parts, he clutches a saggy blue purse at his groin with both hands. The notary’s twinkly eyed smile is supercilious rather than sympathetic. Its subtle cruelty is echoed — made almost grotesque, in fact — by the smirk of his young assistant. There is often, of course, an element of narcissism that seeps into our responses to Dutch Golden Age painting. Mistaking images of a very different society for a sort of cute and uncorrupted precursor to our own, we are always on the lookout for what is familiar, for clues to who we are and were somehow fated, as a modern Western democratic republic, to become. The temptation should be resisted. The 17th century was a long time ago. The Dutch were different. It’s more interesting, surely, to seek out those differences than to succumb to the vanity of “recognizing” ourselves. And yet it’s easy to understand why the tendency to seek out the familiar in Dutch painting is so hard to shake off. There is so much about the world these great painters depicted that feels intimately acquainted with our own. It’s not so much that bakers and shopkeepers and a busy harbor and a stock exchange and a federated republic all existed in the Netherlands in the 17th century, just as they do in the US today. It’s the way all this is conveyed. Almost uncannily, these images match our own apprehension of the feel of reality in ways that the best paintings from 17th-century Italy, France, England, or Spain simply do not. Rembrandt, for instance, showed us not just what wealthy Dutch burghers looked like, but what it felt like to occupy a body at a certain age while wearing certain clothes, and what it meant to be part of a mysterious narrative arc involving other people, the life of the spirit, the natural world, and the fact of mortality. Baer is reminding us that the astonishingly lifelike paintings in this exhibition were made to be sold. They were made to look beautiful or interesting to their wealthy contemporaries, not to act as neutral documents that would somehow “explain” Dutch class structure to future generations. Dutch painters were just as often engaged in communicating ideals and aspirations as they were in reflecting reality. Aesthetic conventions and the search for individual style also, of course, played a huge part. As the show moves into images of the lower classes, those conventions (among them a tendency toward caricature) become more explicit. So do certain moral biases. Images of the poor were not made for the poor. They were made for the middle and upper classes, and they reveal a complex set of attitudes toward their subjects. Charity played a huge part in Dutch society and self-image, with the result that it was considered better to be poor in the Netherlands than anywhere else in Europe. But an idea of the “undeserving poor” — drunken riffraff, loose women, and so on — also held sway. So there are fantastic images of men passed out and vomiting in an inn (Adriaen Brouwer) and of women grinning lewdly while squatting to urinate in the grass (Jan Steen) to complement more dignified and humane paintings of men receiving alms (Jan Van Bijlert) and impoverished children eating porridge (Pieter Duyfhuysen). Indicators of class, both obvious and more oblique, are strewn throughout the show. You could spend days unpacking the class significance of different dog breeds. Shoes, too, are ubiquitous, and you don’t have to be a foot fetishist to be caught peering repeatedly at pointy pumps, spurred riding boots, or shabby shoes with their fronts cut off (presumably to allow for growth). Two sections are devoted to labor and industry. One focuses exclusively on women at work. It begins with Nicolaes Maes’s reverie-inducing “The Lacemaker” and ends with a rousing slap: Jacob Backer’s portrait of a prostitute. Depicted with deep lines under her otherwise lively eyes, she brazenly displays both her stark white breasts and a single, shiny gold coin. The same wall also features well-kept, whispering interiors, in the style we think of as classically Dutch, by Pieter de Hooch, Jacob Duck, and Gerrit Dou. (The Dou, a candle-, lantern-, and fire-lit scene of a woman and girl clearing a table, is ravishing). The adjacent section gives us a glimpse into rarely depicted aspects of Dutch industry, including herring fishing (a key driver of the economy), beer-brewing, and dairy farming. 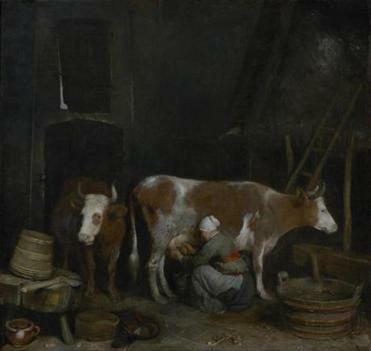 Ter Borch’s “A Maid Milking a Cow in a Barn” is as engaging and beautiful as any picture in the show. It’s linked, surprisingly, to Jacob van Ruisdael’s invincibly calm image of linen bleaching on distant fields under a big sky. Bleaching linen — a flourishing industry in Haarlem — was a seven-month process that involved laying the fabric out under the sun for 48 hours after soaking it in buttermilk, so it helped to have dairy farms nearby. The final section, featuring images of all the classes mingling, is small, but packed to the rafters with concrete particulars. A couple of the paintings, such as Johannes Lingelbach’s “Dam Square With the New Town Hall Under Construction” and Hendrick Avercamp’s “Winter Scene on a Frozen Canal,” have that “Where’s Waldo?” character so many love in Dutch painting. A third of the paintings in “Class Distinctions” have never previously been shown in the US. But that’s only a small part of what makes this the finest group exhibition mounted in Boston in over a decade.